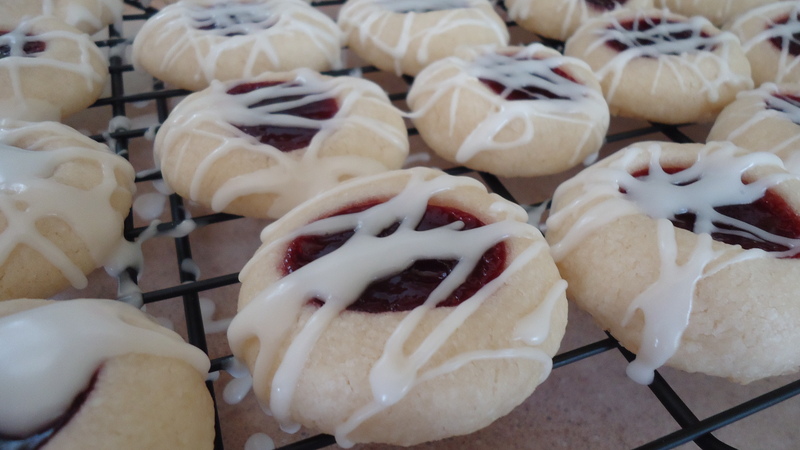 Shortbread is a great cookie, and this thumbprint version is very easy to make, despite its somewhat fancy appearance. The dough is basic; you could probably use any flavor jam or preserves for the thumbprint, and the almond glaze is optional. In a mixing bowl, beat butter on medium speed for 30 seconds. Add granulated sugar and ½ teaspoon almond extract and beat until combined. Cover and chill dough for about one-half hour, until easy to handle. Place raspberry jam in a small bowl and stir it slightly to make it easier to spoon. Shape dough into one-inch balls and place on an ungreased cookie sheet about two inches apart. Use your thumb to make an indentation in the center of each cookie. Spoon about one-half teaspoon of jam into each indentation, filling it completely. Bake 10-14 minutes, until edges are light golden brown. When completely cool, drizzle with almond glaze. In a medium bowl, combine powdered sugar, 1 teaspoon water, and almond extract. Add enough of the remaining water to make a drizzly consistency. Drizzle over cookies and allow glaze to harden before serving.